You can set your watch by it, every 39 years a Dodger hits for the cycle. For those of you who enjoy Aflac trivia, the last one was Wes Parker in 1970 - the last one until today anyway. 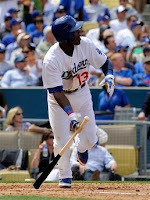 One of the newest Dodgers, 2nd baseman Orlando Hudson, has broken the long drought. An opening day hammering of the Giants is always sweet, but when you can tag Randy "rat face" Johnson for seven runs and sweep Wes Parker into the history books it's even better. In the span of a week, I've gone from "meh, he's OK" to a full-on mancrush on the O Dawg. First, it's really nice to have a 2nd baseman who doesn't hate his teammates for a change. Secondly, he's pretty damn good. He's solid with the glove and has a surprising bit of pop in his bat. TMS is now taking bets on who will hit for the cycle next for the Dodgers, you know, in 2048. I'm guessing whoever it is is a few years away from the big leagues...or even being conceived.